Campbell Hills Guest Ranch, Kamloops, BC, Canada. 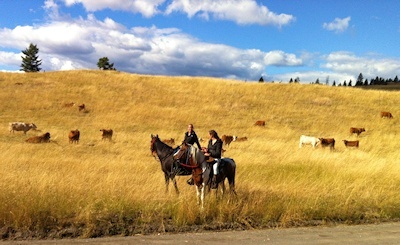 Guest Ranch Vacations in BC's Thompson Okanagan Region. 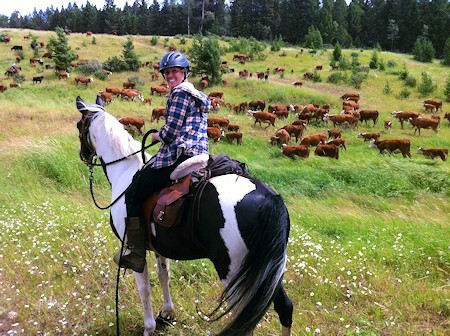 Situated in the most picturesque ranching country, in the heart of the Thompson Okanagan region of British Columbia, Campbell Hills Guest Ranch is your home away from home! 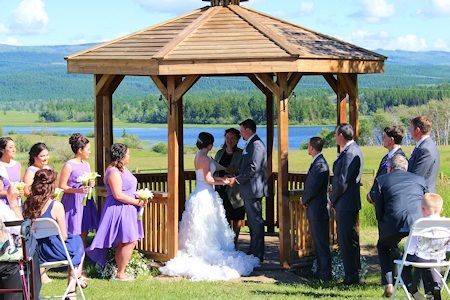 With our free roaming horses in a natural setting on 160 private acres, and surrounded by crown land where bald eagles, moose, deer, coyotes, black bears, cougars, owls and bluebirds live amongst us, this is perfect harmony! 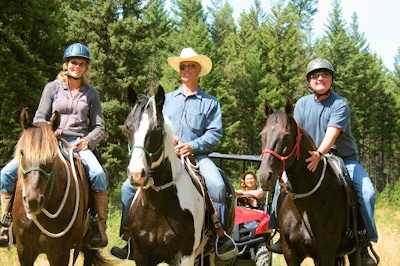 Campbell Hills Guest Ranch is a small personal guest ranch, located only 25 min. from downtown Kamloops. The ranch accommodates max. 16 people. High quality food, western hospitality, privacy, customized programs, max 5 riders per 2 wranglers on trail rides are our basic standard. 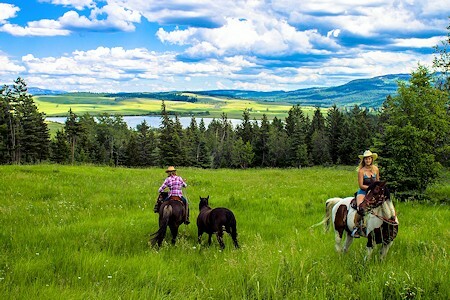 After the introduction to the horses our trail rides will take you to beautiful Lakes, Forest Trails, Natural Meadows, Hill Tops and View Points! We want to emphasize that we match each individual to his/her horse and customize our trail rides for all the different levels of riders. We walk, trot and canter for longer periods of times to the ability of each person. For Kids under 8 yrs, we offer pony rides in our arena, grooming horses and donkeys, walk with our mini donkeys! 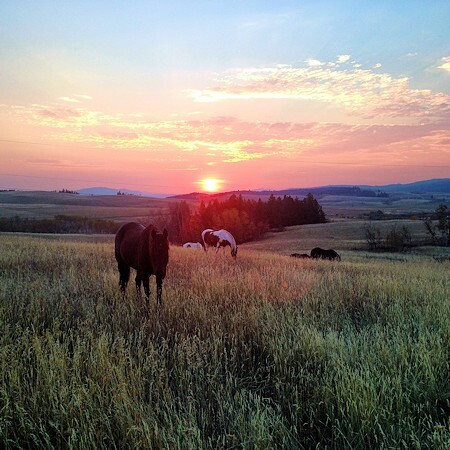 After a scenic trail ride you come home to Campbell Hills Guest Ranch BC. 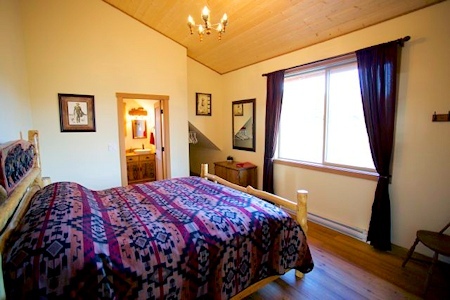 Our smoke-free main lodge features the Wild Horse Saloon, a fully equipped games room, a commercial kitchen, a licensed bar and a wide porch with inviting rocking chairs overlooking Campbell Lake.Upstairs, 2 beautiful cozy rooms each with a handcrafted king size log bed, plus a full private bathroom. 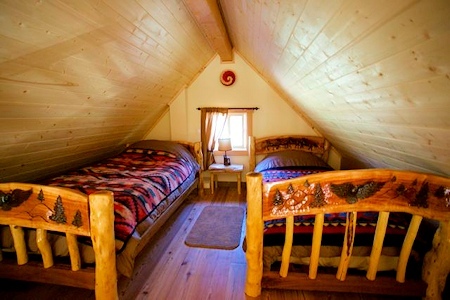 In addition to the lodge we have 2 deluxe smoke-free cabins featuring the warm western style living room with a cathedral ceiling plus cozy wood stove, 1 bedroom (queen bed) with an additional sleeping loft (2 single beds) & a full bathroom. 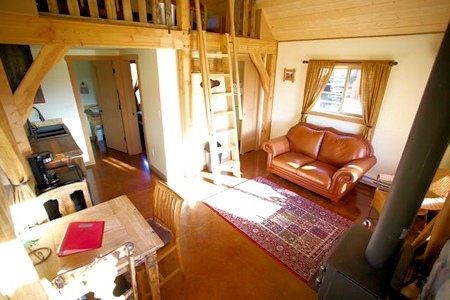 Cabins sleep up to four and are double occupancy only. Enjoy beautiful views of gleaming Campbell Lake and beautiful Monte Hills right out of your window or your private deck. 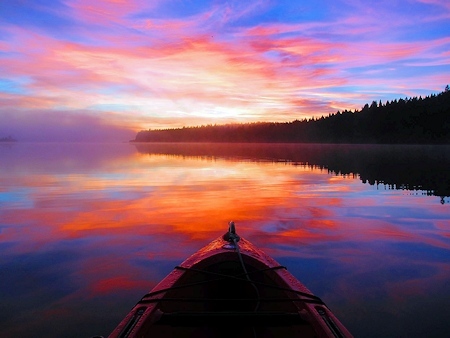 Don't miss out on the scenic morning sun, rising above the lake. Quality and comfort are very important to us. Free Wi-Fi in the main lodge and cabins. Old Fashioned Games Room: Air Hockey, Fuss Ball, Pool Table, Darts, Poker! Fitness-Room: Cardio Fitness Equipment, Free Weights, Weight Station for Upper & Lower Body, Bozu Ball, etc. Hiking: The Ranch has 160 acres with marked and mapped trails treating you to the panoramic vistas that the interior of beautiful British Columbia has to offer! Horse Shoe-Pitch: Pitching horseshoes is a tradition of warm weather, good friends and family, and time spent together. A fun, easy and historical game! Bocce: 'You can have a Ball' with this Classic ball game! Fire Pit: Time for star gazing and story telling! Bird Watching / Photography: Use of our Quad (side by side) to bring cameras etc. to a variety of locations to spot bird life! Personal attention, Passion for Food & Gourmet Meals, Deluxe Cabins, Romantic rooms plus ensuite are words that describe our Guest Ranch! We invite you to come explore the endless trails, alpine meadows on horseback, many fishing lakes and forests so close to Kamloops BC!